Beautiful Ecuador. A photo from the hacienda belonging to my husband’s family in Cuenca. Ecuador is the home of the Galapagos Islands, aromatic coffee, delicious chocolate, and my husband. He was born and raised in Cuenca, a charming colonial city in the mountains. Although we reside in the United States with our two children, my husband always makes it a point that we always stay connected to the place he still refers to as home. We got engaged on his hacienda (family’s land), honeymooned in the Galapagos Islands, and continue to vacation in Ecuador every year. My children love visiting with their abuela and primos and enjoy all the natural splendors that their father’s home country has to offer. Ecuador is always very much in our minds and in our hearts. So, on April 16th when we heard the news that a 7.8 magnitude earthquake hit the country, we were a little rattled ourselves. We learned that my husband’s family was safe, and although they were over 200 miles away from the epicenter they felt the tremors of the quake. They explained that the ground thunderously shook for over a minute, rattling chandeliers and unhinging doors. It was like nothing they had ever experienced before. 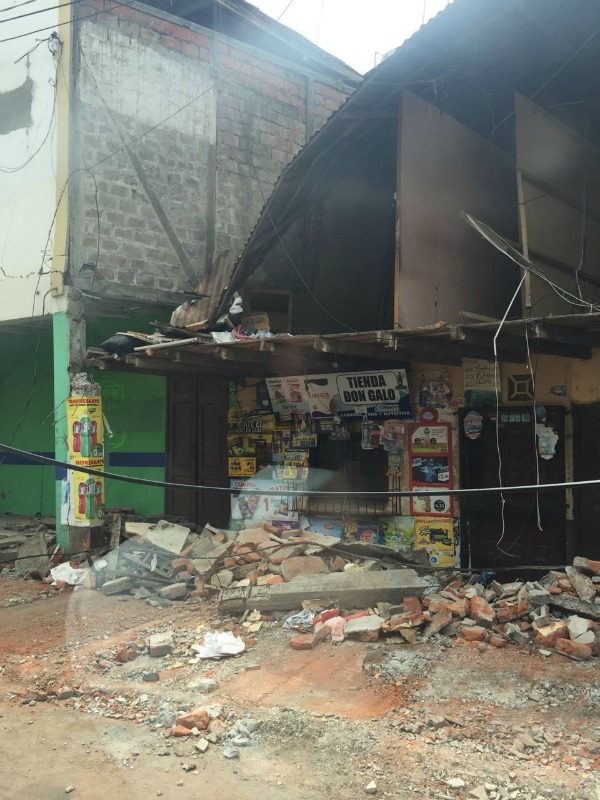 What remains of a gift shop in Manta, Ecuador after a series of recent earthquakes recently in April 2016. Manta is Ecuador’s largest seaport on the Pacific ocean. The epicenter was located in the coastal region of Ecuador, which includes some port cities, picturesque coastal towns and small fishing communities. Buildings crumbled to the ground, over 600 people were killed and thousands were displaced from their homes. Most of the area impacted is very poor with limited infrastructure, most of which was destroyed. Initial efforts focused on emergency response and rescue. Organizations like the Ecuadorian Red Cross (Cruz Roja Ecuatoriana) along with other civil and governmental organizations were mobilized quickly. Yellow tape marked “Peligro” warns people of danger after the roof and balcony collapse of a building in Manta, Ecuador after the earthquakes in April 2016. Based on my experience, this is a small and proud country. People boast about everything Ecuadorian including their fruit, wildlife, history and rich traditions. During this difficult time, they have pulled together to help their fellow compatriotas. My husband’s family helped stock a mobile hospital that headed to the area immediately after the quake to provide emergency health care. Others provided food, clothing and basic essentials. In the days following the earthquake it became clear that the needs of the people were growing and that the rebuilding process was going to be slow. Access to clean water has become critical. Imagine not having safe water to drink or cook? Once again, local families and companies in the surrounding areas joined together to provide water treatment equipment to service a small portion of those affected. They are making steps forward, but it’s still a long road ahead. There are many organizations that are still offering assistance in the area, according to our family there. One of them is Oxfam, which is working with the Ecuador government to provide safe water and storage to the area. The organization is also focusing on sanitation measures to prevent water borne diseases, especially among children and senior citizens. My family in Ecuador has seen Oxfam’s work on the ground and asked us to donate. We, in turn, are helping to spread the word. 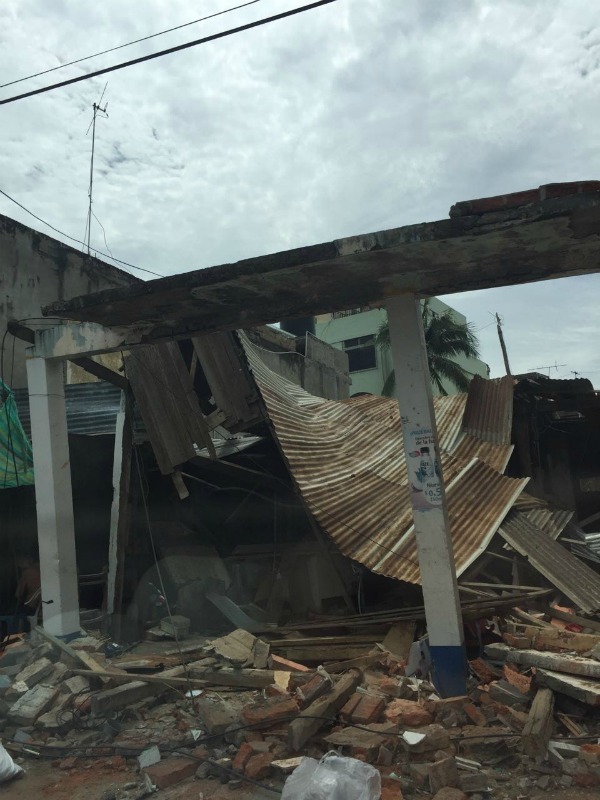 A collapsed and bent tin roof and damaged building supports lean atop brick rubble in the aftermath of the earthquakes in Manta, Ecuador last month, April 2016. The phrase si se puede is a phrase that enthusiastic Ecuadorian sports fans chant to support their teams. It means “yes, we can.” This phrase has become the motto of the relief efforts. From the hearts of my family and the people of Ecuador who are in dire need of clean water in the aftermath of the earthquake, please consider donating to Oxfam to help the people of Ecuador see that the country’s chants of “si se puede” will overcome this natural disaster. 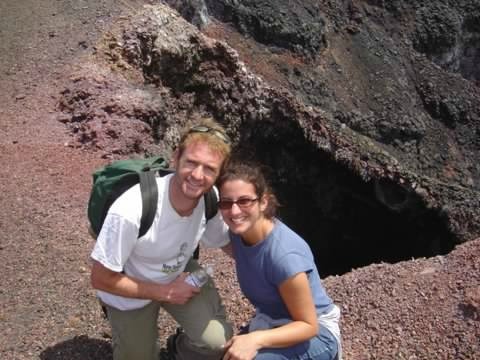 Angela and her husband on honeymoon in the Galapagos Islands, Ecuador after they first married in her husband’s home country 10 years ago. 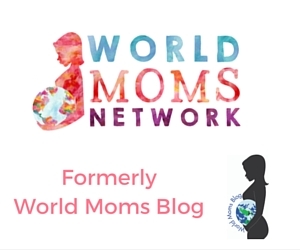 This is an original guest post from a World Moms Blog reader, Angela Vega, who is mom in the USA of two sensitive and curious children who keep her very busy. Before deciding to stay home with her children, Angela worked in the field of marketing and advertising. 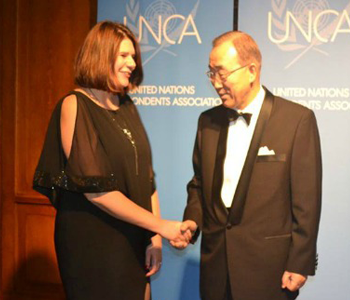 She earned an undergraduate degree from Villanova University and an MBA from Thunderbird School of Global Management, where she met her husband. 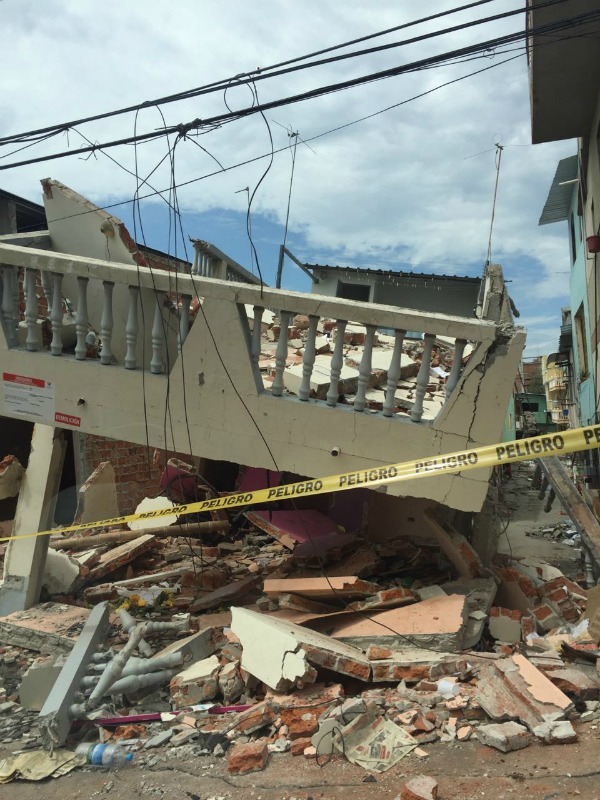 Photo credits of the earthquake damage and hacienda to Pedro Vega on the ground in Ecuador. Photo credit to the author for the honeymoon photo. « BRAZIL: What to do when our role models die? 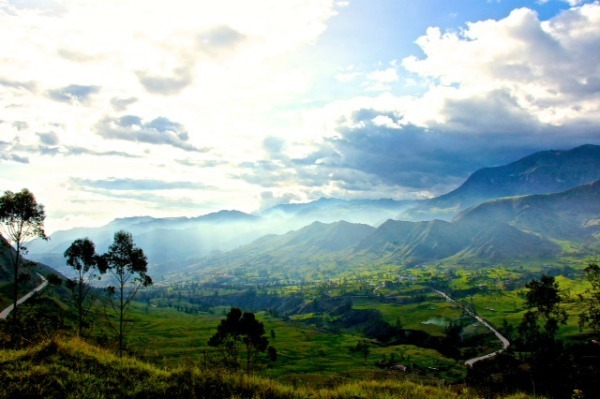 Thank you for sharing the story and photos from your husband’s family in Ecuador. The photos are heartbreaking. I am so glad that you are spreading the word. And thank you to Pedro for the photos that tell the story. There is so much work to be done! I have donated. I hope things continue to get better for all those affected in Ecuador. There is so much going on that brings sadness, that it is especially good to hear about people helping other people. It is a happy thing to hear.